on our quest to review different models of air purifiers. The 18155 is a true HEPA air purifier. As always we are going to take a look at what this air purifier can do for you. What type of filter it uses? How large of a room can if filter? What kind of warranty does it have? Notice I put the cost last. I know that the price is an important consideration for many people. However, I believe that if you consider price first, you are asking for trouble. This is especially true if you plan on using the air purifier for a long time. Stick with me here as I explain each of these in relation to the Honeywell 18155 Air Purifier. One of the most important things you have to think about before you buy an air cleaner is what type of filter it has. There are three popular kinds of filters: HEPA, Electrostatic, and Ionic. HEPA filters are the most efficient filters. They can trap up to 99.97% of the particles in the air. The downside is that they also must be replaced periodically. This Honeywell air purifier uses a true HEPA filter. It is very efficient and removing stuff from the air. Honeywell claims that the HEPA filter in the Honeywell 18155 is a permanent filter and will never need to be replaced. You will just need to clean it twice a year with a vacuum cleaner. This air purifier is designed to clean a room that is 255 square feet. While that sounds really great, we need to make sure this gives us the correct nummber of air exchanges. Air exchanges are how many times all the air in a room is cleaned in an hour. In order to be effective an air purifier should be able to exchange the the aire at least 6 times an hour. For this model that means you should use it in a smaller room. A room 11 feet by 17 feet (187 square feet) is the right size to get the recommended 6 exchagnes. You can read more about air exchanges and why they are important here. The area this machine can clean is not bad when you consider that this is not really a large unit. It measures in at 17"L by 18"D by 16"H. This is still small enough to occasionally move it to another room. The Association of Home Appliance Manufacturers (AHAM) gives each air purifier a rating. Air Purifiers are not required to be tested, so not every air cleaner has these numbers. The numbers should also not be taken as concrete. They are just a guide to give you an idea about the performance of an air purifier. You can read more about CADR number and how they are found here. The numbers for the Honeywell 18155 are alright, but they are not great. So How Much Do I Pay Each Year? Since the HEPA filter is a permanent filter, there is no filter to buy. Although we believe that no filter is truly permanent and eventually you will have to buy a new filter. There is a pre-filter to replace also. The pre-filter runs aroudn $10 a pack and this is for a package of two. These should be replaced at least every three months. So that means about $20 a year. This air purifier normally sells for right at $200. Quite frankly, you should never pay more than $150 for this model. The cheapest place we have seen it is on Amazon. The regularly sell it for less than that. No matter how careful you are and how well you follow instructions, something can always happen. For this reason you really need a warranty. The Honeywell 18155 Air Purifier, like the rest of Honeywell Air Purifiers, comes with a five year limited warranty. This air purifier has received great reviews from most consumers on the internet. It has an average of 4 out of 5 stars on Amazon. "...really seems to work great and I have no complaints." "You can really feel (and breathe) the difference in the air when you turn this on in a closed room." "I was and still am amazed at how quiet this thing is..."
"I've found that I'm less congested. I would recommend this product." "I immediately noticed a big difference - I could breathe easier, especially at night!" There were some complaints about this air purifier around in cyberspace. Aside from the occasional one where someone may have gotten a lemon, there was a person who complained this machine did not remove smoke all that well. The obvious answer is to NOT smoke inside, but no one will listen to that one. If you main concern is removing smoke this is not going to be a good cleaner for you. You honestly will need to find an air purifier designed to remove smoke, like the Blueair 403e. 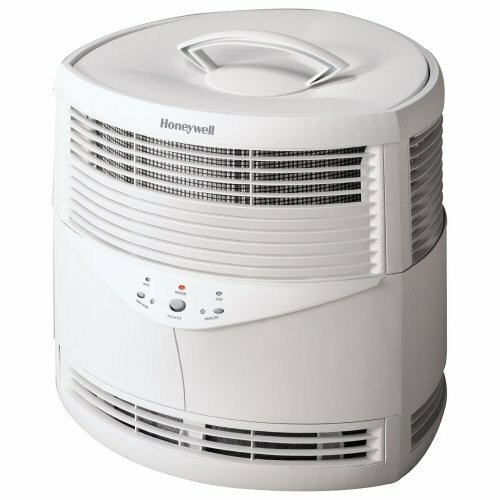 Where Can You Buy the Honeywell 18155 Air Purifier? You can buy this air purifier from Amazon. From what we can tell after surfing around the internet, they currently have the lowest price out of all the other retailers. The best place to read more reviews from people who actually use this product is on Amazon. At last count there were 126 reviews about it. Click here to read more. Return to Honeywell Air Purifiers. Return to All About Air Purifiers Home Page.